was built there just for them. to get in once its light. Doctors Klaus-Dieter and Martina John dreamed of becoming medical missionaries to serve poor people in remote and dangerous places. They studied in top universities, raised funds, and moved their family from Germany to establish a world-class hospital deep in the Andes Mountains in Peru. Through expert care and a love for all God's children, Doctors Klaus and Tina have changed the lives of thousands of Indians who had never before received medical care. 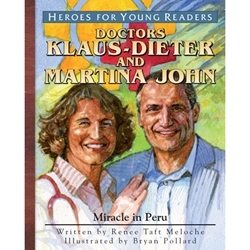 Now Heroes for Young Readers makes Doctors Klaus-Dieter and Martina John's remarkable story available in this picture book all ages will treasure.